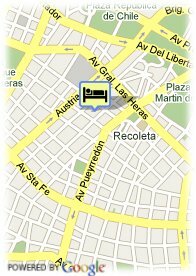 Blue Tree Hotels Buenos Aires Recoleta is located in the most charming district of Argentina's federal capital, close to the Bellas Artes Museum and the Palermo Gardens. A modern and sophisticated hotel that makes good use of the home feeling concept. There are 45 rooms conceived with a minimalist and sophisticated decoration, with air-conditioning, minibar, telephone, safe and a wireless internet connection. The 3 suites are located on the hotel's penthouse with a balcony that offers a privileged view of Recoleta. Paid public parking near the hotel (covered) (11.00 km).